Low Carbon Prosperity Institute (LCPI) analysis indicates that Washingtonians spent over $24 billion on energy in 2015 – down from nearly $28 billion in 2014 – with nearly 60% ($13 billion) spent on wasted energy. Efficiency gains are an opportunity to generate immediate economic benefit and foster a clean technology boom. (Read about 10 opportunities to reduce wasted energy). The share of energy that is wasted in Washington State represents the majority of energy produced each year, and is also a significant source of greenhouse gas (GHG) emissions. According to updated analysis of Department of Energy (DOE) data, with Washington-specific power consumption and electricity generating conversion factors applied, nearly 60% of the energy consumed in Washington in 2014 was wasted rather than utilized. This includes over 40% of electricity generation inputs and 80% of transportation fuel (Table 1). Total energy consumption at prevailing 2015 prices cost Washingtonians $24 billion – approximately the same as the State government operating budget 1 For 2017-2019 biennium, total Near General Fund-State (“Near GF-S is the most useful view of the budget because it’s what the Legislature and the governor have the most control over.”) are $44 billion, or $22 billion per year on average. – with $13 billion of that expenditure going towards energy wasted primarily as released heat. At the same time, the greenhouse gas emissions associated with that energy waste translates to roughly 50 million metric tons of carbon dioxide (MtCO2), equivalent to 58% of the state’s total in 2013, the latest year for which statewide emissions were reported. At $13 billion dollars and 50 MtCO2, this works out to over $260 paid for each metric ton of carbon emitted in return for no useful energy services (see Appendix for more details). Reducing this substantial quantity of waste, along with the money we spend on it, represents a meaningful opportunity to increase economic prosperity in Washington State while decreasing environmental degradation. That’s a win-win. That’s Low Carbon Prosperity. 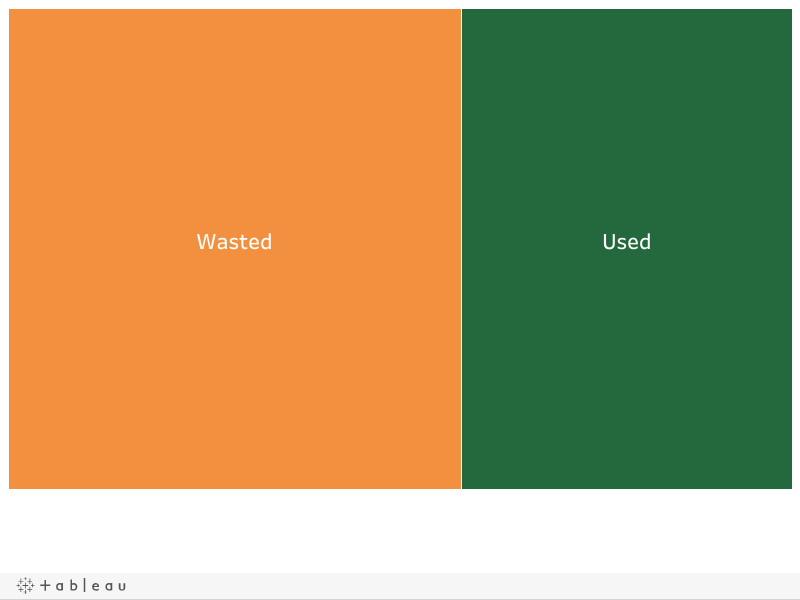 How much energy do Washingtonians waste? According to DOE data, analyzed by Lawrence Livermore National Laboratory (LLNL) and presented in the Sankey Diagram below, nearly 70% of the energy consumed in Washington State in 2014 was wasted rather than utilized. This includes over 80% of transportation fuel and two-thirds of power generation energy (Figure 1). LLNL August, 2016. Data is based on DOE/EIA SEDS (2014). Separating out energy flows by sector, as in Table 1, sheds some light on the relative contributions to wasted energy. In the original LLNL Sankey Diagram (Figure 1), electricity generation accounts for over half of the wasted energy, with transportation a distant second. By correcting the analysis of electricity generation in Washington state, it is clear that transportation not only has the lowest conversion efficiency, as the LLNL analysis shows, but as a very inefficient use of energy also generates roughly half of the total wasted energy. We analyzed the underlying data, noting a major adjustment was needed to accurately capture the efficiency of non-thermal power plants.2 Credit to LCPI contributor Steve Meginniss for identifying this as a likely substantial error. The LLNL Sankey analysis applied a thermal power plant conversion efficiency across all electric generation which significantly underestimated the efficiency of Washington’s hydro-dominant electric sector (see Appendix for more details). After updated analysis, the wasted energy share in Washington is lower, 57% rather than 68%, but still represents the majority of energy produced and consumed each year. Our analysis indicates that in 2014 wasted energy totaled 911 trillion BTU’s in Washington (Table 1), and that value increased to 943 trillion BTU’s in 2015 (Figure 2). How much does wasted energy cost Washingtonians? We’ve established that the majority of energy used in Washington is wasted. How does that translate to cost? The economic cost of wasted energy can be calculated two different ways: (1) the expenditures by end-users of fuel (e.g. home natural gas, power plant coal that is lost as heat, commercial end-use electricity, etc.) on energy that is ultimately wasted; or (2) the lost-revenue opportunity from inefficiencies in power production and delivery. Clearly, transportation fuels are the predominant wasted energy expenditure, at over 70% of the total despite accounting for half of Washington’s total wasted energy. Given total energy costs to end-users of $28 billion in 2014 and $24 billion in 2015, the share of purchases towards wasted energy was nearly 60% in 2014 and 2015. Although more energy was wasted in 2015 than 2014, the total costs went down as a result of falling fuel prices. Taking the second perspective, the potential retail value as electricity of otherwise wasted power plant energy is used to calculate potential additional revenue for utilities using average statewide retail rates in either Washington or in California where much of Washington’s excess electricity production is sold.4 Ranging from $21.04/million BTU in Washington to $44.49/million BTU in California for 2014, and $21.85/million BTU in 2014 to $45.30/million BTU in California for 2015. (EIA SEDS) The potential range of economic value if waste in the power sector were fully converted to retail electricity in 2014 was $4.8 billion, at Washington retail prices, and $10.2 billion if exported at California retail prices. In 2015 the wasted economic value grew to $5.2 billion to $10.7 billion respectively. The higher-end of the lost revenue associated converting waste into new electricity production to sell to California exceeded the cost of waste in the transportation sector in 2015 ($9.6 billion). Total retail sales of electricity in Washington in were $6.4 billion in 2014 and $6.6 billion in 2015. Potential additional revenues are of the same magnitude as current sales. It is not unrealistic for Washington to increase exports of electricity by reducing wasted energy in electricity generation.5According to the EIA as of November 2017 (accessed August 6, 2018): “Washington produces more electricity than it consumes, and exports its surplus power to Canada and 13 other western states.” Doing so could boost our economy, using an influx of of state dollars to reduce our in-state electricity prices. Washington already benefits from some of the lowest cost electricity prices in the nation, with average retail rates of 7.7 cents per kWh, providing a unique advantage that attracts industry, reduces cost of living, and makes the economics of electrifying end-uses more favorable. These low costs flow largely from our low thermal waste, hydroelectric power dominated grid. However, this waste impact analysis clearly indicates that prices could be driven even lower by further reducing thermal power plant waste. If we combine the opportunity cost of converting current electricity generation waste into extra electricity sold to California with the expenditures for wasted energy in other end-uses, most notably transportation, the total economic value of waste in Washington State was $22 billion in 2015 (Figure 3); basically the same spending authorized per year under the State General Fund within the 2017-2019 biennium budget.6This is a near-GFS funds perspective, representing “ the most useful view of the budget because it’s what the Legislature and the governor have the most control over: https://www.ofm.wa.gov/budget/state-budgets/2017-19-enacted-budgets/interactive-state-budget-2017-19-enacted Even without capitalizing on additional electricity sales potential, the expenditures on wasted energy compare closely to authorized expenditures on Education. Having less waste than other regions does not indicate a shortage of opportunities to develop and implement the technology that reduces wasted energy and increases productive outcomes. In fact, Washington possesses unique potential to reduce waste by increasingly utilizing its relatively clean (and getting cleaner) and efficient (and getting more efficient) electricity generation. This translates into a tremendous opportunity in vehicle electrification, for example. The challenge is to accelerate that wasted energy reduction, reaping economic benefits for the effort. We look at specific technology opportunities already available in more detail in a follow-up article (link). Looking forward decades into the future, it is highly likely that the world will be burning much smaller quantities of fossil fuels while using those fuels much more efficiently. Some country, or region, is going to become the leader in energy waste reduction technologies, providing immediate local dividends by slashing expenditures on wasted energy and freeing up resources for more productive segments of the economy. Reducing wasted energy is a multi-billion dollar opportunity for Washington state in just avoided costs. An opportunity that translates into more money pumping through our economy, and into our checkbooks and bank accounts. The economic opportunities through technology leadership and sales world-wide are already in the hundreds of billions annually (IEA World Energy Investment 2018). Washington businesses, lawmakers, and residents should consider strategies to reverse the current drain of opportunity and money lost to wasted energy. Wasted energy in Washington can be dramatically reduced (link to opportunities), saving billions of dollars for Washingtonians, and establishing a competitive advantage for growing another substantial global industry. That’s a win-win. That’s Low Carbon Prosperity. Read on about 10 waste reduction strategies for Washington State.